Welcome to Skywatch Friday where people from all over the world post great photographs of the skies in their part of the world. Your Skywatch Friday hosts are Yogi, Sylvia, and Sandy. So what in tarnation is the Independence of Guayaquil you ask. Guayaquil is the capital city of the South American Country of Ecuador. On October 9, 1820 the citizens of the town overthrew the local Spainish authorities and declared their independence. I have never been to Guayaquil but would love to go because it is supposed to be a beautiful city. It is called the Pearl of the Pacific. I saw the ship above in New Orleans a few years ago. 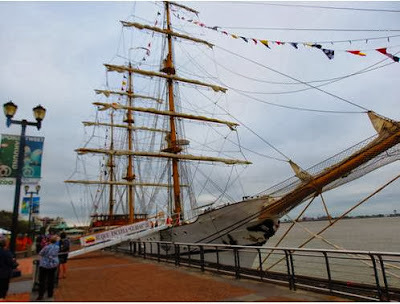 It is the BAE Guayas, an Ecuadorean Navy training ship. I think it is beautiful. 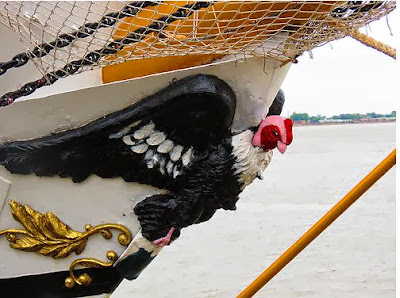 What made the ship memorable to me is the condor figurehead as show below. I mean scantily clad women may be more traditional but there is nothing cooler than a condor for a figurehead. At least in my opinion.